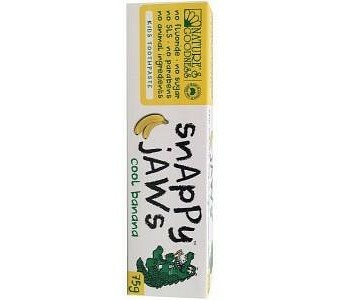 Nature's Goodness Australia Snappy Jaws Kids Toothpaste - Banana Flavour is a yummy tasting toothpaste made exclusively for kids. It contains xylitol, which is a natural substance that comes from birch trees and acts as a natural sweetener in toothpaste. So when your kids brush their teeth with Nature's Goodness Australia Snappy Jaws toothpaste they will love it because of the fruity burst of banana flavour and it prevents tooth decay and plaque and gum disease leaving your kids teeth healthy and strong. Natural banana fruity taste motivates children to brush their teeth Nature's Goodness Australia Snappy Jaws toothpaste is made with natural ingredients Completely sugar free Contains no SLS and no fluoride Active ingredient xylitol prevents cavities from forming One Nature's Goodness Australia Snappy Jaws Banana Flavour toothpaste tube is 75g Ingredients: Xylitol (from birch tree), calcium hydrogen phosphate, water, sorbitol (from berries), glycerine, hydrated silica, lauryl glucoside (from palm), natural flavour, vegetable gum, citric acid, potassium sorbate, peppermint oil, natural colour.